It's no secret that I love Ballyneal. I love (and need) the wide, rolling fairways. I love the large, wild greens. I love the firm and fast fescue turf. I love (and need) the absence of a single hazard or out-of-bound stakes. I love walking up, down and around the dunes. I love everything about the place. Now picture a course with 25-yard wide, tree-lined fairways. Imagine overhanging trees guarding grainy, relatively flat bermuda greens that are less than 30 yards in diameter. Imagine out-of-bound stakes on both sides of most holes. Imagine a cart-paths only journey through a dead-flat swamp. You know me well enough by now. Does this sound like something that I would enjoy at all? Never has the term 'horses for courses' rung more true than at Harbour Town. The guys that like this course and tend to perform well are the shotmakers -- guys that can work the ball in either direction and possess great precision with their irons. Harbour Town is not your typical PGA Tour bomber's paradise. In other words, guys not like me. I don't think I'm a horse for any type of course these days, but Harbour Town is the one course most likely to turn me into glue. I can't even hit a pitching wedge straight anymore. How am I supposed to land a 170-yard shot on a green the size of your living room? That's probably the main reason (that and the exorbitant $220 greens fees) that I have played just about every course on the island in three previous trips to Hilton Head but have avoided Harbour Town like the plague. There was no chance that the course and I would get along. But a funny thing happened in the Lowcountry. I enjoyed the course tremendously, even if it is the anti-Ballyneal. I remembered why I liked Pete Dye so much. Love him or hate him, you have to give him props for getting golf course architecture out of the doldrums of the Robert Trent Jones, Sr-driven 1940's and 50's, a.k.a. the Dark Ages. And if there's one thing Dye is good at, it's thinking about angles of attack. Nowhere is this more true than at Harbour Town. Simply being on the fairway is not good enough. Often you have to be on the correct spot (and when I say spot, I mean a 8-yard wide strip) of the fairway. And while the greens are by far the smallest on tour, often you can only hit to one quadrant of the green. Even on these small greens, a change in the pin placement has a dramatic shift on what you need to do off the tee. In a year where my success is not measured by fairways hit, but in drives simply kept in play, I was doomed for sure. I stocked up on Pro V-1's in the pro shop. I practiced 3-irons on the driving range. I sent a letter to all area homeowners warning them to stay out of their backyards and apologizing in advance for any broken windows. With all those white stakes, triple digits was well within the realm of possibility. When our playing partner offered the opportunity to hit a mulligan after my first tee ball, I declined. It was a solid drive by my standards, even though the ball hit a tree and ended up in the pine straw only about 180 yards off the tee. Chances are my breakfast ball would've been much worse. Thankfully, the short game was there to bail me out. I knew things were looking up when I made a 10-footer to save bogey on the first hole. Chipping or putting bailed me out from disaster multiple times. On the short par-4 ninth hole, I duck hooked a drive into jail far right, hit gap wedge through a four-foot wide gap in the trees to 30 yards short of the green, then hit a nifty flop shot to four feet past the hole and made the putt for an all-world par save. On the back nine, I thought my luck had run out on the 15th hole. After a decent drive and a hooked second shot that hit a tree and bounced back into play, I chunked a routine 7-iron dead left and into the water. 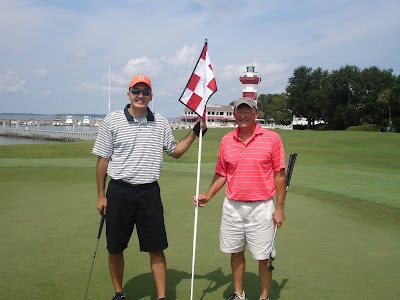 The par 5's are definitely scoreable at Harbour Town and I had just capped off playing the three of them 5-over par. With the famous closing holes coming up, breaking 90 was now in doubt. The 16th hole is a 95-degree dogleg-left par 4 that wraps around a giant bunker (you may remember Stewart Cink taking an agonizingly long time removing every surrounding grain of sand on this hole when he won the Heritage in a playoff. It was a waste area back then. They've since changed it to a hazard thanks to Cink's antics.) I stepped up to the tee with the ill-advised idea to hit a fade around the corner, but ended up bombing it dead straight to the far end of the fairway. In my only other good drive of the day, I was trying to hit a big fade and hit it dead soild and straight. Maybe I'm on to something. So there I stood in the middle of the fairway with lob wedge in my hand in a rare, green-light opportunity. This used to be my wheelhouse. Instead, I flubbed my approach shot short of the green. So much for birdie. But then I putted from off the green, up the slope to the back-right pin (on these greens, back right means no more than 8 paces beyond center), and the ball curled sharply right-to-left as it approached the hole. Could it be? Yes! The ball struck the flagstick sharply and dropped in. Sweet manna from heaven…a birdie! I am a short-game wizard. In the distance, I could see a guy on the observation deck of the lighthouse watching the golf action with binoculars. I had Chuck videotape my drive with my iPhone. I couldn't disappoint my loyal fan base (not counting my three kids, the number now stands at four: Jefe, Wego, still-in-the-honeymoon-stage Wyatt and this dude on the lighthouse.) 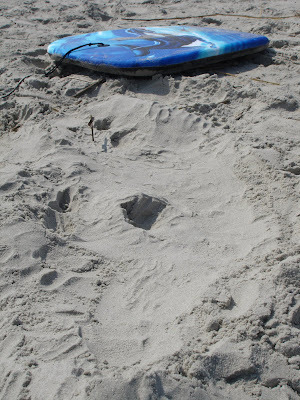 I stepped up and ripped one -- the patented, low draw made a return visit! Good to see you again. Where have you been? Jim: birdie-par-birdie finish at HT! Jefe: Nice. What about the other 15? Truth be told, the stellar finish gave me a 83, which sadly is my second best round of the year. Remember when I used to write about shooting 72's? It seems like eons ago. But none of the matters now because…birdie-par-birdie finish at HT! It was the perfect way to end an enjoyable round on a course that I never thought I would like. So maybe that's the moral of the story. 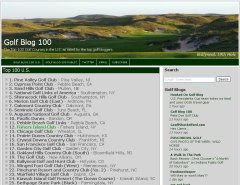 One thing I learned from recently compiling and launching the (gratuitous plug alert) Golf Blog 100 is that there are lots of different ways to define greatness when it comes to golf courses. And different golfers can have completely different criteria and both be right. Let's celebrate diversity. 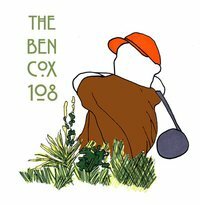 My goal with the Golf Blog 100 was to collect a wide-range of opinions from a diverse panel of well-traveled, passionate golfers and combine the results into an overall ranking that best represents this collective view. Harbour Town ranks 58th in the U.S., and after playing it, I can't really disagree with that combined assessment. One problem I have with Golf Digest's Top 100 is they dictate the exact criteria and weights that make a golf course great. They explicitly don't ask their panelists for an overall rating, pompously assuming they know the exact formula. Seems strange that they trust 900 panelists enough to assign a value to a nebulous concept such as 'Shot Values' but don't trust them enough to know whether overall a golf course is good or not. My round at Harbour Town cemented the fact that there is no one formula. What makes Harbour Town great is a completely different set of values than what makes Ballyneal one of the best golf courses in the world. Ballyneal gives you the freedom to choose any number of ways to get the ball close to the hole and then challenges you on each and every putt on the green. Harbour Town dares you to hit certain types of approach shots to get close to the hole. If you can pull it off, you are rewarded with a relatively straightforward putt. In both cases, you'll eventually be asked to pull off a shot or two that you're less than comfortable with. 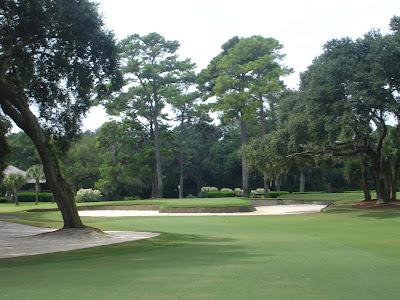 Other than the birdies, my most memorable shots at Harbour Town were a low pitching wedge with 40-yards of hook on it on the 12th hole, a 9-iron approach on the front that was the perfect trajectory under one large branch and over another and that gap wedge on the 9th out of jail. 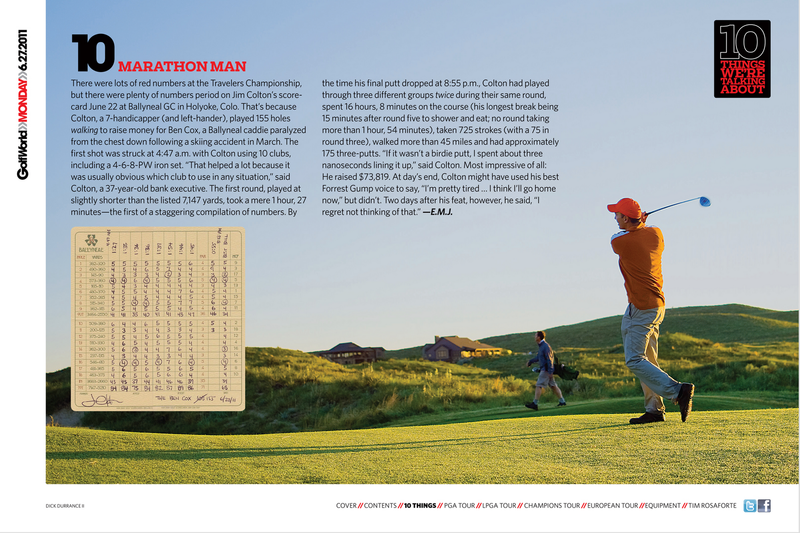 I can guarantee you none of those situations would occur at Ballyneal. 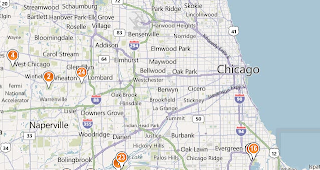 So, does this mean that I'm going to go home from vacation and immediately join Medinah? Probably not. But that doesn't mean that I would automatically hate the course or couldn't see the merit in somebody liking it. I probably know what you're thinking, because it's likely the exact sentiment that Jimbo sent back after I e-mailed him and others the picture that afternoon. I realize you have a deep love for Ballyneal and Tommy to the D. When you first joined Ballyneal, I thought, good for you, you are following your passion. The excessive purchasing of Ballyneal paraphernalia; mostly normal. Shortly after joining, when you talked about Sue possibly painting a Ballyneal mural on your office wall at home; I just chalked that up to your quirky (obsessive) personality, and thought nothing more of it. Ah, but what a slippery slope you find yourself on. Referring to Tommy to the D as your new "BFF"......the impromptu trip out to Ballyneal at the end of September.....the endless stream of posts on GCA, the blogs, the midnight phone conversations with Wyatt all about Ballyneal.....All red flags. And now we have beach sand reconstructions of the 7th at Ballyneal, done in disturbingly accurate detail. I ask, where does this madness stop? At what point is it enough? If things continue down this darkened path (and I see no evidence to lead me to believe otherwise) I fear one day you'll find yourself sitting with your family at dinner, Sue attempting to tell you about her day, your kids eager to share their adventures, and YOU will be hunched over, grossly absorbed in reconstructing the 4th hole at Ballyneal from your mashed potatoes. ".....Just how big is that blowout on the right side of the fairway? And the elevation of the green. How severe is it? Sue, can you pass the mashed potatoes?" A grim and bleak future indeed. Jimmy C, I say this, because I love you; you need help. Granted, none of the recipients of this e-mail are qualified to provide that help. We all have our issues. But that doesn't mean you cannot be saved. There is still time for you.